DETROIT – As the first American-born head coach in franchise history, perhaps it’s only fitting that Jeff Blashill rounded out his first Red Wings’ coaching staff with a patriotic flavor. “I guess for me it means I got some other guys to help cheer on Team USA come World Junior time,” Blashill said. On Tuesday, Blashill announced that he’s adding – or in few cases keeping – Americans Tony Granato, Pat Ferschweiler and Chris Chelios, along with Jim Bedard and Dave Noel-Bernier to his staff for the upcoming 2015-16 campaign. All five appointees have had some previous role in the organization, including Ferschweiler and Noel-Bernier, who where assistant coaches under Blashill at AHL Grand Rapids last season. While it’s interesting to note, the fact that four of the six men on the Wings’ coaching staff are American-born is purely coincidence. 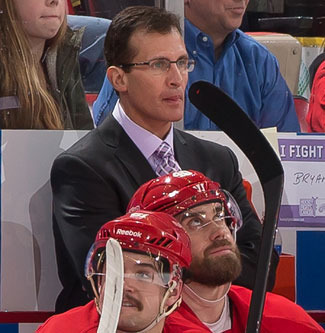 Granato and Ferschweiler will join Blashill as his assistants behind the Wings’ bench during games. In his second season with the Wings, Granato, an Illinois native, will continue his role of running the defense and the penalty kill. Ferschweiler will coach the forwards and work with the Wings’ power play, which ranked second in the league last season. Noel-Bernier, 39, has been added to the staff as a video coach, and Bedard will return for his 19th season as the Wings’ goaltending coach. Of those added to the coaching staff, Ferschweiler, who was born in Minnesota, probably has the longest running relationship with Blashill. The two coached together for one season each at Western Michigan University (2010-11) and with the Griffins (2014-15). “Pat has a great hockey mind, he is one of the best guys I’ve been around, helping individual players get better,” Blashill said. “I think one of the things that we owe to our players is to help them become the best players that they can be each and every year. That’s a promise that I’m gonna make to the players and Pat is going to have a big impact on that, especially with our forwards. Granato and Bedard are the only holdovers from Mike Babcock’s staff, and Blashill is glad to have them. Keeping Bedard on staff was equally important for Blashill, a former collegiate goaltender himself. Bedard has worked diligently with Jimmy Howard and Petr Mrazek, while building a trust and respect among the goalies, who more than likely, will battle for the No. 1 job in training camp. Chelios, another Illinois native, is an interesting piece to the coaching equation. For the past three seasons he’s commuted to Grand Rapids, where, periodically he worked with the organization’s young defensemen. The hall of famer will continue that role now in Detroit instead of Grand Rapids. Aside from his role at practices, the 53-year-old Chelios will also be asked to evaluate in-game player performances and offer insight and observations to the other members of the coaching staff. He will attend all home games, and on occasion, join the club on the road. Last week, Chelios accepted an assistant coach position with USA Hockey at the 2016 World Junior Championship in Helsinki, Finland. Noel-Bernier comes to the Wings with video coach experience from his time at his alma mater, the University of Nebraska-Omaha, where he was director of hockey operations, video coach and assistant strength and conditioning coach from 2007-10. From a transitional standpoint, the familiarity that the players and the coaching staff will be a big plus, Blashill said.